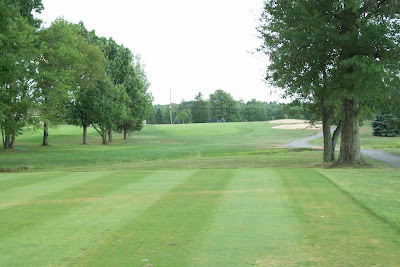 Three weeks after winning the Steve Young Invitational Outing, I was able to tee it up for the first time this season for an individual round of golf. The cloudless sky let the sun shine and there was not a hint of rain. I played alongside one of my family members at The Fairways Golf Club. 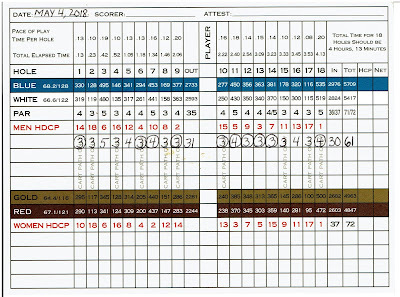 My round started out well, with a par at the First Hole, but after missing the green right on the Second Hole, I three-putted for a double bogey. I made bogeys at the Par 3 Third and Fourth Holes after missing the green on both my tee shots. I made my first big mistake of the season by hitting my 4-wood dead left at the shortened Par 4 Fifth Hole. 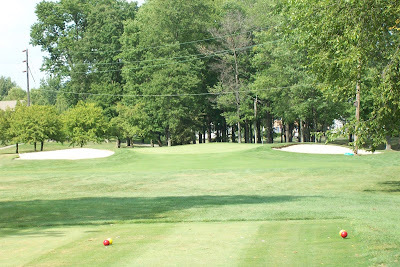 After a drop and lay up down the fairway, I missed the green left with my fourth shot and made a triple bogey 7. A scrambling par at the Sixth Hole was followed by another double-bogey at the long Par 3 Seventh Hole when I again missed the green left, then failed on my pitch to reach the putting surface. 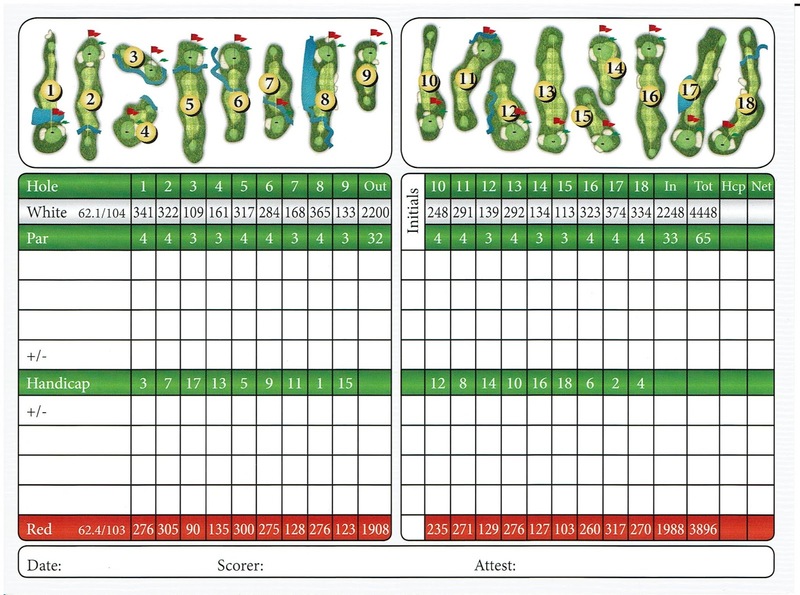 I closed out the front nine with two more bogeys for a score of 43. The back nine started off with another tee shot that ended in the left rough on the Tenth Hole. 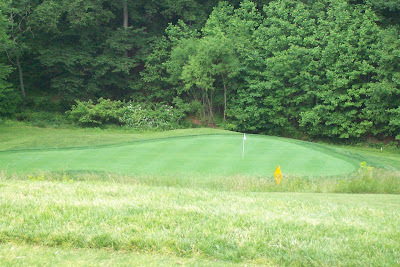 I thinned my approach shot over the back of the green, then again three-putted for a 6. I made bogeys at the next four holes, just lipping out a birdie putt at the Par 3 Twelfth Hole. 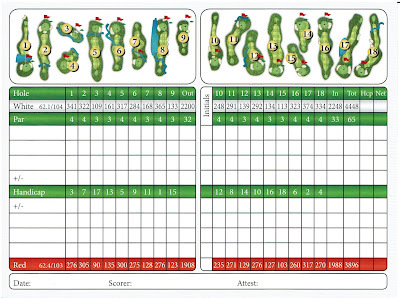 I made back-to-back pars at the Par 3 Fourteenth and Fifteenth Holes. I finished out my round by sandwiching double bogeys around a bogey at the Sixteenth, Seventeenth and Eighteenth Holes. That gave me another 43 on the back nine and score of 86 for my round. Overall, I managed to get around the course and post a decent score, but I was too often in trouble off the tee and pulled alot of shots left. My putting also not what it was at the outing three weeks ago. I think I started playing too much break on my putts. But these are things that I think will correct themselves with more playing. I made a couple of changes to my bag from the season opening scramble: substituting a Wilson Staff FG Tour F5 3-Hybrid for my 7-Wood and a WS V4 Utility 4-Iron for the 4-Hybrid I carried previously. This past Friday was set for the first individual round of the year. A 10:30 tee time awaited my cousin and I at The Fairways Golf Club. But the meteorologists were all calling for heavy downpours throughout that day. Even the course called Thursday with a warning to call and make sure they would be open before traveling there. So I did the natural thing and canceled Thursday while we spoke on the phone. My instincts were confirmed Thursday night when my cousin called to say he didn't want to play Friday due to the predicted weather. So what happened Friday? Nothing! Some light sprinkles in the morning, but the main showers stayed to our south. The day was mostly overcast but dry. Frustrated that an opportunity to play golf had slipped away, I decided I would attempt to play at least nine holes at The Fairways on Sunday afternoon. The skies appeared clear enough, so I readied my carry bag and headed off to the course. 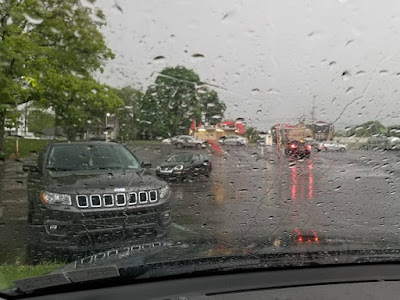 And naturally, I drove about a quarter-mile when the heavens opened up! I had to pull off the road for about 10 minutes waiting for the rain to ease up. As I again began driving to the course, the gray skies gave intermittent showers, so I decided to head for the Mad Golfer for some practice. At least there I would be undercover and able to hit some golf balls. I purchased a jumbo bucket and took up a spot on the range, laying out my alignment stick and warming up by stretching and hitting 12 balls with my lob wedge. And what happened? That's right; the clouds disappeared, sun came out, and it was a beautiful afternoon. Oh well. At least I was hitting golf balls. The practice gave me the opportunity to test out the Callaway Big Bertha Alpha 815 Driver I had put back in my bag. I had adjusted the loft to 11.5-degrees and wanted to see how it played. After hitting 24 balls, I adjusted the loft back to its original 10.5-degrees and hit 24 more shots. I hit some good shots straight down the range, but I also hit an alarming number with a giant fade to the right. The session convinced me to put my Wilson Staff Smooth Driver back in the bag. 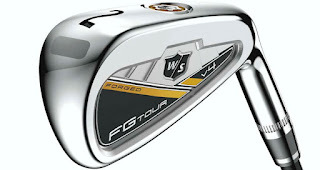 Next, I hit my FG Tour F5 4-wood, both off the tee and off the turf. I picked up this club last season, but was unable to really use it due to the heart surgery. 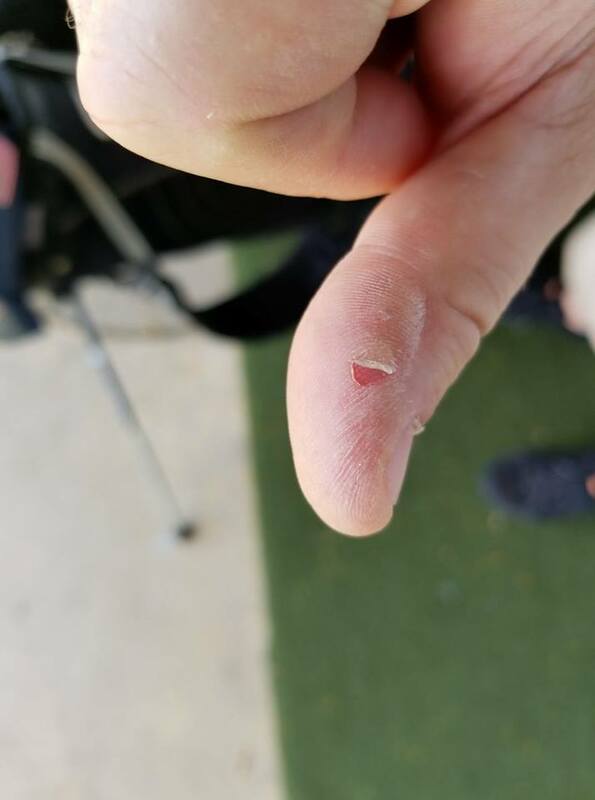 Today demonstrated to me that I need some more practice with the club, but I think it will be a good addition to the bag. 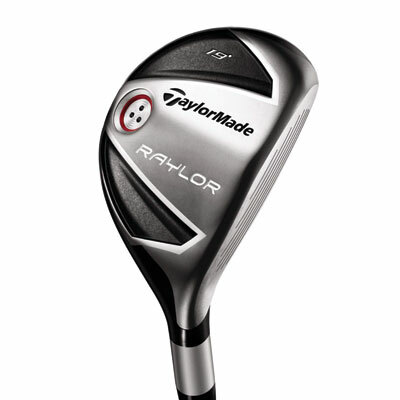 I followed the 4-wood with my FG Tour F5 3-hybrid, another club I have not had much of a chance to work with yet. I picked up this club to replace my 7-wood on shorted courses, giving me some flexibility in my arsenal. Again, I need to work with more, more I again, think this will be a good addition. I finished my practice with my V4 Utility 4 iron, hitting six shots off the tee and six off the mat. While the weather didn't entirely keep me from hitting golf balls this weekend, it did cause me alter plans, and in both cases, unnecessarily. My practice with my long game was beneficial and hopefully, the weather will allow for more play and less practice in the coming weeks. Yesterday's forecast called for severe weather to begin rolling through the region in the late afternoon. Because of commitments, Mrs. Muni Golfer had the car until the late afternoon. As the clouds were turning the skies gray and the temperature was beginning to drop, I knew I would not have enough time to get in even nine holes. But I did feel optimistic that I could at least get in a bit of practice, so I headed out to the Mad Golfer to use the practice range. 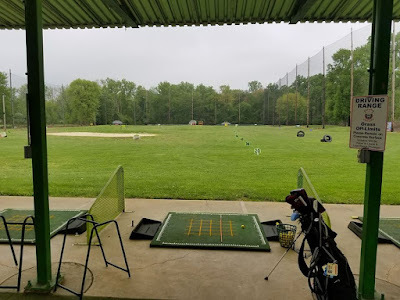 Based on my play in last week's golf outing, I felt I needed some work on my fairway woods and long irons/hybrids, so I made that area the focus of my practice. 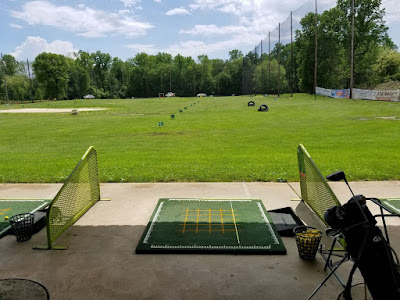 I purchased a large bucket of range balls and found an empty stall at what was a surprisingly crowded range. 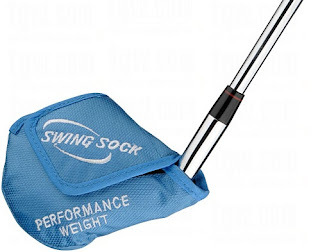 After putting down my alignment stick, I used my weighted Swing Sock on my 7 iron to loosen up, then hit 10 lob wedges, followed by 10 8 irons to warm up. I am still trying to decide between carrying a 4 hybrid and a 4 utility iron. So I hit 10 balls with my Wilson Staff V4 Utility 4 iron and my Callaway Heavenwood 4 hybrid. I hit balls much better with the 4 utility than I did the hybrid. The result is the V4 will be going in my bag for the next round. Next up, I hit 10 balls with my Callaway X Hot 7 wood, then 5 balls with my Wilson Staff FG Tour F5 4 wood. I made solid contact with the 4 wood, and okay contact with the 7 wood. I still need to practice with both, but they will remain in my bag for now. 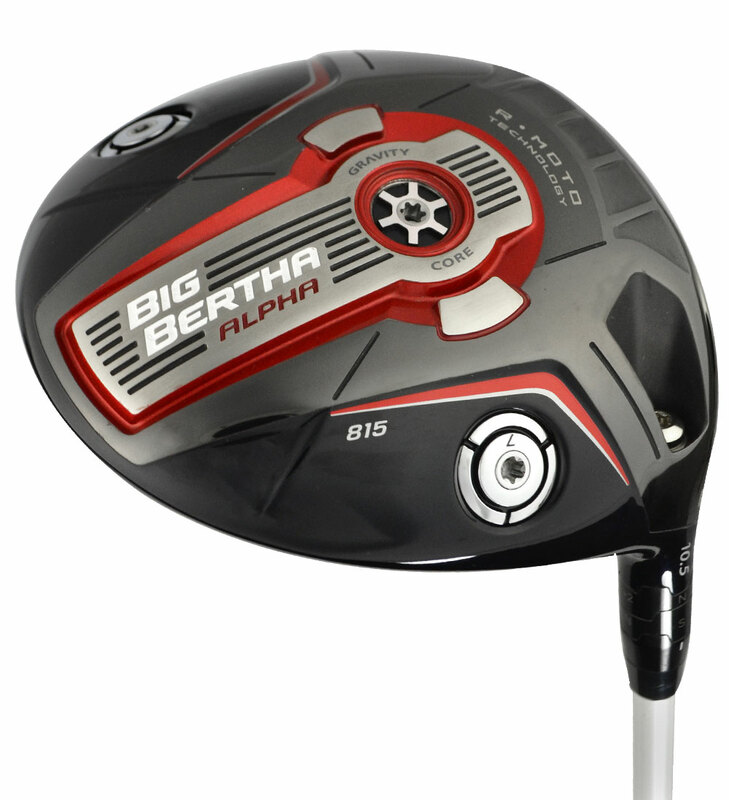 I finished off my practice by hitting 15 balls with my Callaway Big Bertha Alpha 815 Driver. I purchased this driver nearly two years ago when Sports Authority was going out of business and played about seven rounds with it during the 2016 season. For some reason, I went back to my Wilson Staff Smooth Driver, but I am putting the Callaway back in the bag. At the range yesterday, I hit the ball solidly and with a good trajectory. An adjustable driver, I had it set at 10.5-degrees loft and a neutral setting. Last night I increased the loft to 11.5 degrees, still in the neutral setting, so I will need another session at the range this week to see how that works, but I expect to play my next round with this driver in the bag. As the skies continued to darken during my practice, I knew I was in a bit of a race against the weather. As I was hitting my last three balls with the driver, the rain began. Fortunately, I was undercover and during a brief letup, I was able to get myself and my clubs in the car. Practice was complete and the weather was beaten. 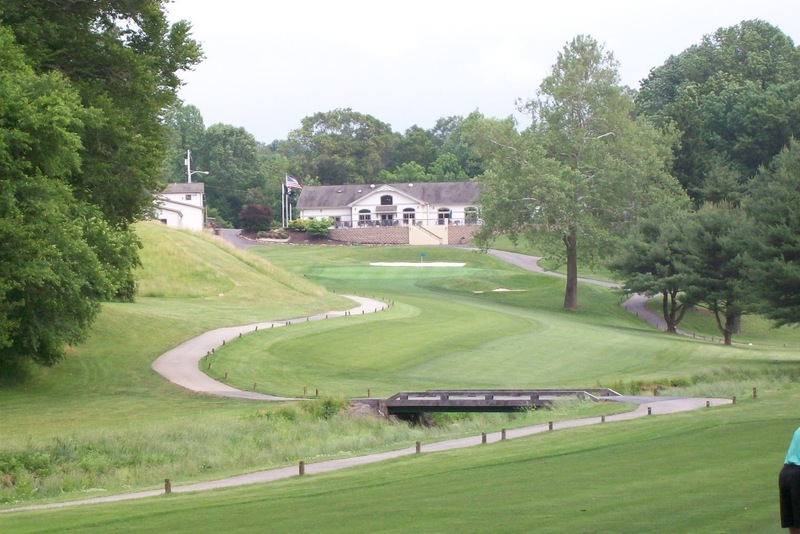 850 Paxon Hollow Road, Media, Pa.
What a way to start a golf season! 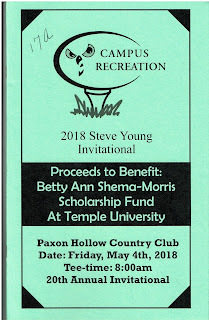 As you know, my first round of the year was in a charity golf outing that raises money for scholarships at Temple University. To prepare, I made three trips to the practice range in hopes of finding some type of game before we teed it up yesterday. Well the practice paid off as my foursome won! Playing at Paxon Hollow Golf Course, a very well maintained municipal course in Marple Township, Pa., me and three partners made 10 birdies--with nearly half being from putt of 20-plus feet--and most importantly, NO bogies, to shoot a 61. And I was quite pleased to contribute five of those birdie putts. None was more gratifying that at the 9th Hole, who I made a 30-foot putt that broke at least four feet from right-to-left. 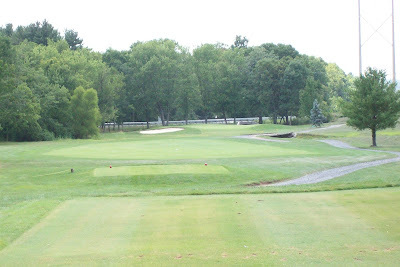 Our round began at the very tricky 17th Hole, a par 3 that is only 115 yards, but plays straight downhill. Temple Men's Basketball Coach Fran Dunphy, a very accomplished golfer, greeted us on the tee. He would tee off first and then groups were challenged to beat the Coach. I am proud to say I not only the sole member of our foursome to put their tee shot on the green, I put it closer to the hole that Dunphy! 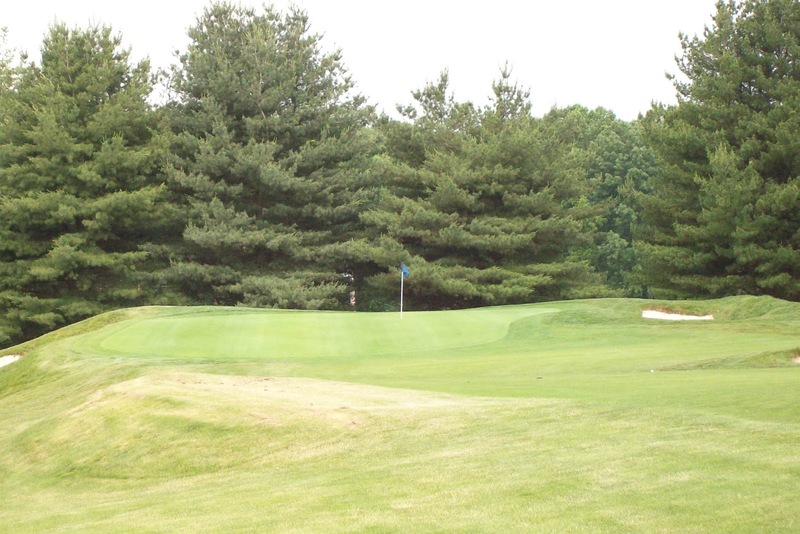 After starting with a par at the 17th, our foursome faced the very challenging, 535-yard par 5 18th Hole. Your tee shot is to a narrow sloping fairway with a creek on the left. From there, the hole uphill towards the green. We made a 15 footer for a our first birdie of the round. I made another 15 footer for birdie at the 1st Hole and made birdie putts the 7th and 9th holes as well. We finished the front nine with a four-under 31. The birdie at the 9th propelled our foursome onto a run which saw us birdie six holes in row (9-14). I began the birdie streak with my putt at the 9th and ended it with another long one at the 14th. At the 15th, a 175-yard par three, we all missed the green and was scrambling to make par when our chips left us a good 30-plus feet from the hole. But my teammate stepped up an nailed it to keep us from dropping a vital shot! That par save may have been the difference as our score tied another foursome's, but we took first place on a match of score cards. Of course, it didn't hurt that we birdied the first four handicapped holes. The outing, and the victory, provided my with a bounty of swag. Just for being in the tournament, I received a reversible fold umbrella, water bottle and $100 to spend on Under Armour merchandise (which I used to purchase a polo, a pullover and a backpack), a book about legendary Philadelphia Daily News basketball writer and Temple alum Phil Jasner (personally autographed by his son the author), and a Temple windbreaker. For winning the event, I received a $75 gift certificate to the Pro Shop, which I used on a Paxon Hollow-logo'd Under Armour polo and two pairs of FootJoy ankle socks. 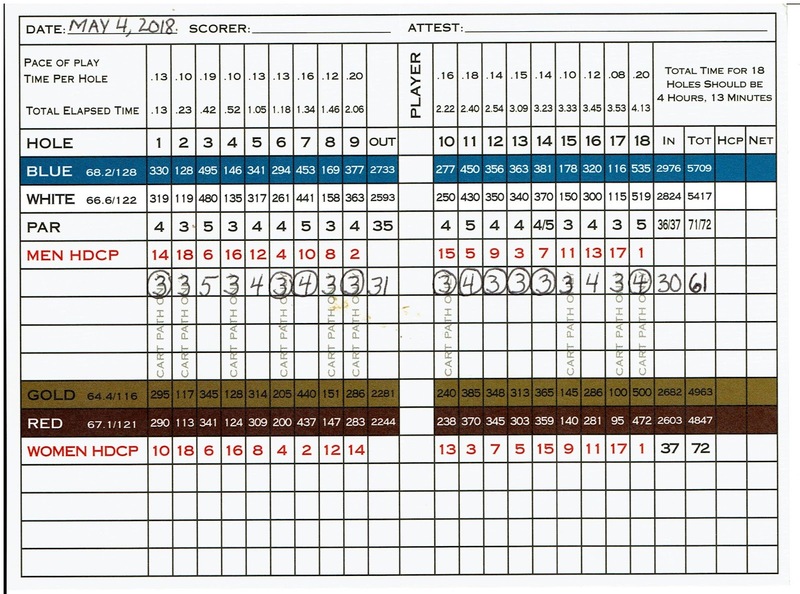 All-in-all, everyone in the foursome contributed to our winning effort: George hit some timely approach shots, Mike boomed his drives which often left us with short approach shots, Bob made several key putts, and I added some key putts and tee shots. My game felt very good for the first round of the season. The only glaring weakness to my game yesterday was hitting my fairway woods and hybrid off the turf. It is definitely something I need to practice and improve upon. Last night, as the last glimmers of sunlight faded across the driving range at Bensalem Township Country Club, I completed my last practice session before I tee it up for the first time this Friday in a golf outing. Although I was somewhat rushing against the onset of darkness, I did manage to hit a large bucket balls. Practically alone on the range. with a warm-up using my Orange Whip. 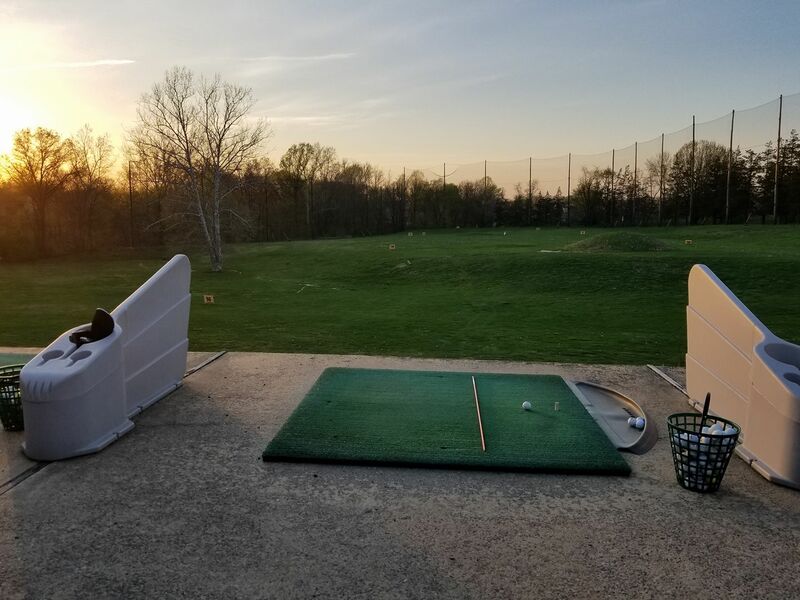 From there I hit my 52-degree Wedge, Pitching Wedge, 9-iron, 7-iron, two 3-Hybrids, and ended things off hitting my Driver for the first time this season. Overall, I feel is in decent enough shape to carry me through the outing. I don't feel I will be completely rusty and embarrass myself; I should contribute some shots to our foursome. I have also decided to keep my Wilson Staff D200 7-Wood in the bag, along with added a 22-degree TaylorMade Raylor Hybrid in place of my 4-iron. Tomorrow night, I will inventory my golf bag, make sure my equipment is ready, check my golf shoes and lay out my golf clothes for Friday. 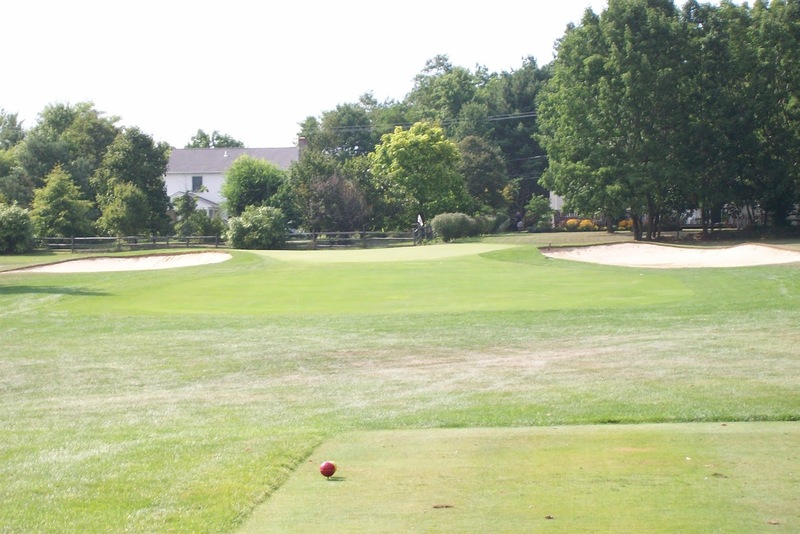 The weather is predicted to be very warm and I can hardly wait for that first tee shot of the season!